More than ever, people have the power to combat the visible signs of aging and keep a youthful appearance that matches the way they feel physically and emotionally. The slow process of aging transforms the round, full face of youth; evenly distributed fat volume breaks down, round features begin to appear sunken, and smooth and tight skin sags and creases. Neck skin and tissue fall and excess fatty deposits develop creating a “turkey wattle.” These visible signs of aging tend to make you appear older, and possibly even heavier than you are. Despite all the preventative resources we have to fight aging factors such as heredity, gravity, environmental conditions, and stress, the natural aging process is unavoidable. Each person experiences aging differently, so there is no “right” age for a facelift. 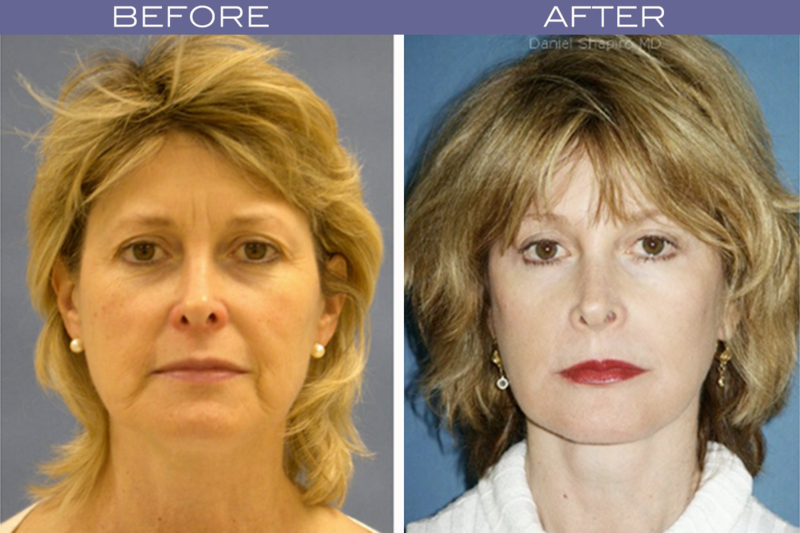 When you feel like your face doesn’t match the way you feel, a facelift may be the right solution. A facelift is a surgical procedure that allows for the correction of many facial flaws and signs of premature aging that can undermine self-confidence. Dr. Shapiro can counteract the effects of time and gravity and restore the naturally vibrant appearance you remember from years ago or even address the early signs of aging before they take hold. Unlike facelifts of the past that produced a “pulled too tight” appearance, current facelift techniques no longer rely upon only pulling the skin to achieve results. There are various types of facelift procedures to meet each patient’s individual needs, including the minimally-invasive Mini-Face Lift, the GenX lift, and the Full Face Lift, also known as a SMAS facelift. No matter which procedure you opt for, the most important factor is the expertise and ability of the surgeon. Dr. Shapiro’s patients benefit so genuinely from his facelifts because he expertly crafts each procedure to the specific needs of the individual patient. A mastery of the intricacies of facial anatomy, mature aesthetic vision, detailed procedural planning and execution, and a passion to provide each patient with the most outstanding result possible are the keys to his successful results. If you feel your face does not reflect your youthful spirit or you feel like you do not look like yourself anymore, you may be a good candidate for this procedure. A well-executed facelift does not make a “new” you; it restores the “you” from 10 or 15 years ago by taking years off of your appearance and improving many areas of the face while re-contouring your neck and jawline. Call Dr. Shapiro’s office (480) 451-1700 today to schedule a consultation and find out why Dr. Shapiro’s facelifts truly are better and what has made him a leader in facial surgery in Arizona for over 23 years.